Front-end development is very important and it ranks a special position in the web development process. Since the main goal of the front-end is to attract more users, serve as a call-to-action, encourage them to use this service as the main solution to their problem. If you plan to hire Angular developers, you should know more about hiring process. It includes understanding of developer's skills, roles and responsibilities, as well as you need to know what hard skills and soft skills questions you should ask them, where you can find web developers and what is hourly rate of Angular dev in various regions of the world. This hiring guide will spell everything out and it will allow you to hire skilled Angular developer. 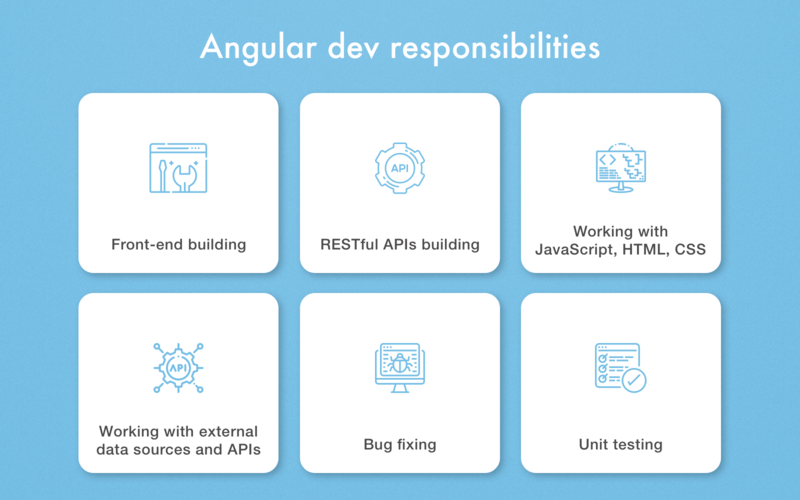 First, it is important to define what Angular developer should do, what is a developer’s role and what responsibilities AngularJS developers bear. Angular developer is working on a client side of software, that is the main task of a developer. They create a full-fledged UI service for web apps as well as websites. In fact, Angular dev usually works with modules and components creation, and then they connect these modules components to build a functional software. There are many tasks that Angular developer must (or sometimes may) be in charge of. Angular developer is responsible for the development of interactive front-end part of various web and mobile apps, especially single-page applications. Angular developer should build high-performance software. This process requires the cooperation of Angular developer with back-end developer to make sure that the development of single-page applications meets the terms of specification and other technical particularities. Developers that code using Angular should perform unit testing after each development phase. It is a mandatory responsibility Angular developer should bear. Testing of components, services, complex testing, testing of code units, and so on. Quality Assurance service can be implemented using tools integrated into Angular. A developer should understand and have the appropriate skills to get access to external data sources and APIs in case if it is necessary to extract the data from any third-party services. When front-end development is completed, QA engineers perform different types of testing to detect any possible bugs. If the one is found, the developer should fix it as soon as possible. Sometimes Angular developers also deal with a code written by other developer and they need to find a bug and fix it. So a programmer should be good at reading another’s code. And the last but not the least scope of Angular developer is to strive for learning new technologies and feel the pulse of new Angular versions that are released each year at the moment. Angular 7 is a current version whereas March-April is a planned release date for Angular 8. Angular tool is very popular for today, and many customers want this framework to be used for web application development. Are you tired of looking for an experienced Angular developer? Drop us a line and we will send you СVs of our Angular developers. When you need to hire a good front-end developer, you should define what Angular version is necessary for your project, and tell more about your project, its particularities, and also reveal details of your other projects (if they were). You cannot just write a specialist, tell them that you are looking for Angular developer and send a link for a job site. It is a wrong way and the majority of good specialists will ignore this offer. All developers appreciate their time and they need a detailed and accurate description of their responsibilities and duties they will need to bear. Mind to indicate a stack of applied technologies so candidates can get acquainted with it and understand more about their role. 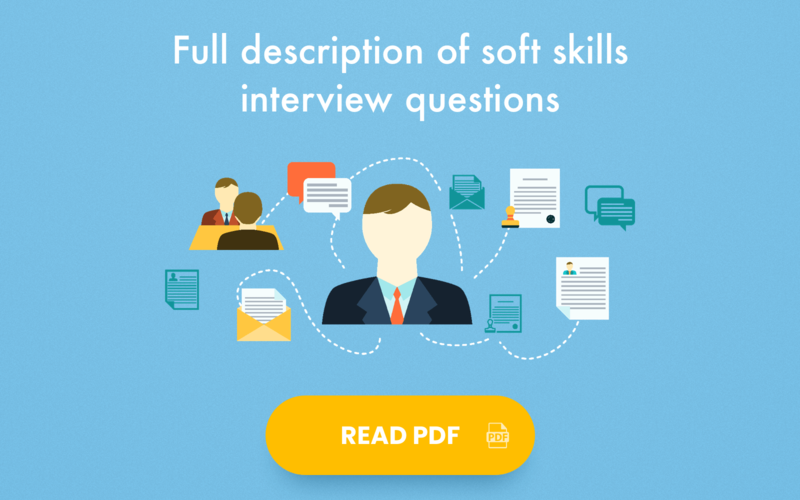 During the first conversation, you have an opportunity to evaluate the soft skills of a candidate (what is it and how to evaluate - read more in the Interview questions section). You may already make a decision how good this candidate is for this position since an interview shows you the potential of this specialist and how they can develop. Now, let’s go deeper into the issue of the required skills for Angular developer. As is the case with any other software developers, Angular developers position may start from a junior developer and grow to middle and senior Angular developer. 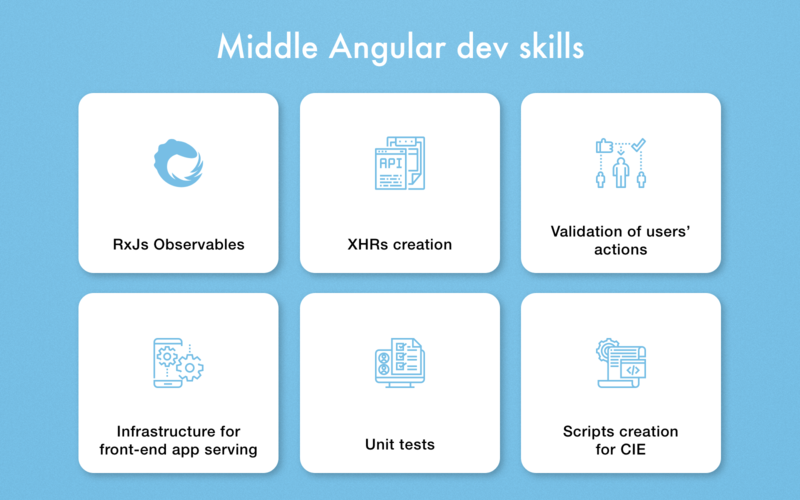 You should know what basic skills all Angular developers must have and what skills are required for middle and senior devs. 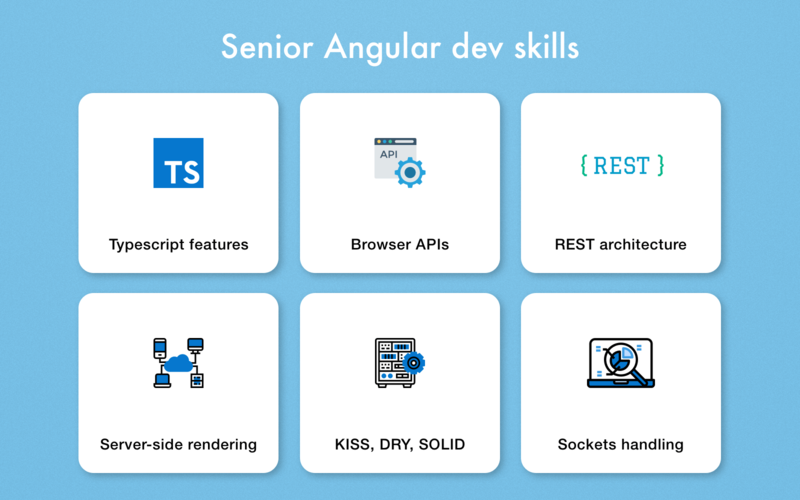 Skills indicated above are good for junior Angular developer, but, in fact, it won’t be enough for you if you plan to create complex software. So you’d better pay attention to skills of middle and senior developers as below. 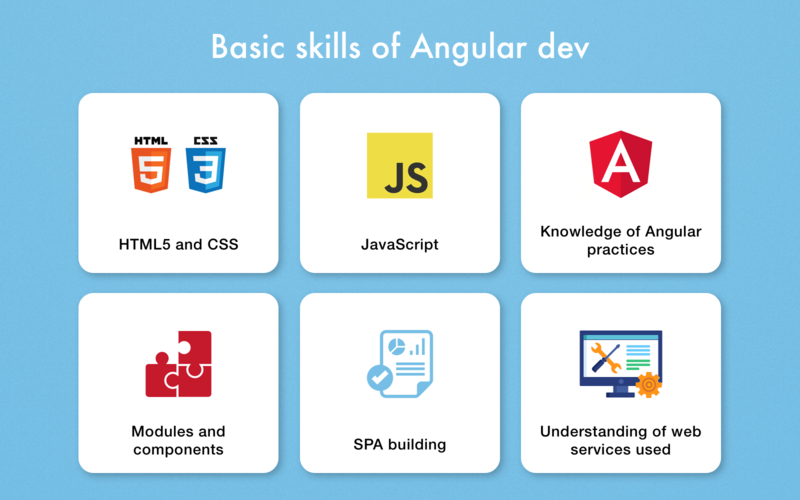 If Angular developer is good at all skills shown above, it means that he/she is very good specialists and able to solve all issues he/she face. However, don’t forget that if specialists aren’t familiar with some of the listed tools, it is not a complete disaster. The main thing whether the programmer is ready to learn or not. Our developers have strong experience in skills listed since we applied them in various projects. Now, let’s define what questions you should ask Angular developers and what answers they should provide you with. These questions are often asked during the interview for Angular developer position to evaluate hard skills of a developer. To read detailed answers to these questions, click on a file below to follow a comprehensive Q&A guide. What are the key components of Angular? How will you handle errors in Angular applications? Our team has available Angular developers that can help you interview potential candidates for your project. Fiil out a contact form and our requirements managers will contact you! The list of AngularJS developer interview questions can be extended but answers for these basic questions are enough to understand the level of a candidate. We will show you the main skills and questions that are asked usually by HR managers, and you can take them into account. The full guide is available by clicking on the picture below. However, note that this list of questions is approximate and each interview requires its individual approach, so questions may be changed according to the situation. Interview questions will help you find the right specialist for your project. But where is a better place to find them? The next section is about it. First, you should determine what type of developer you need. You can hire one freelance Angular developer, or find an in-house developer, or outsource your development and hire a dedicated Angular development team. Which option is better? Let’s figure it out. Freelancers are developers that are working for themselves. 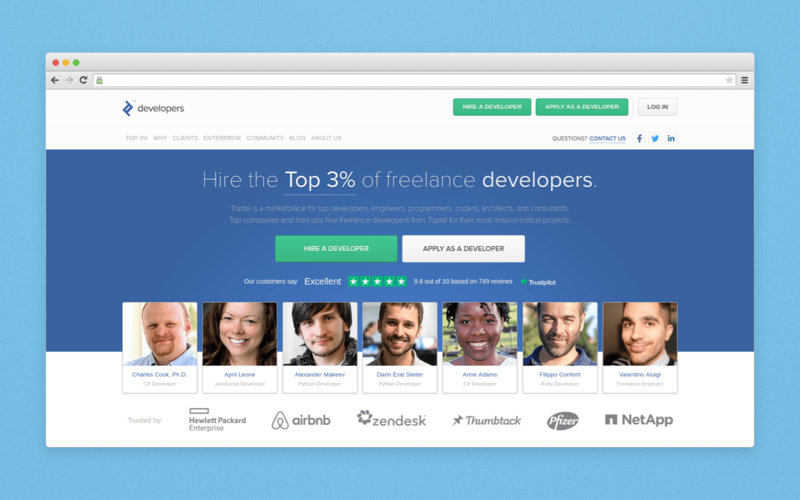 You can find freelance developer through special freelance platforms where specialists post their profiles. You can interview the programmer and find out their skill level. Freelancer may be a good option if you need to create not a complex website or app and you don’t have specific requirements yet. One freelancer will not be able to create high-quality software all alone. Attractive UI/UX, proper testing, back-end, front-end - one specialist cannot be well-qualified at all these fields. However, even if you hire only one Angular developer for your project, if you don’t know how to code, you will not be able to test the quality of the code. And you will need to spend extra costs for bug fixes if something goes wrong, so freelancer is good only when you need to make some changes, not more. Skilled specialists will always help you find the right solution. In-house development means that your product is built under your control in your office and you hire each member of a team. If you have your own startup or a product is too specific, there is a sense to hire a local team or a few Angular developers only that will create your product and collaborate with each other efficiently. You may allocate your local resources on your own and you need to depend on some outsourcing particularities. However, you need to pay rent, monthly wages, and there are other additional hidden costs that may appear, the process is not fixed. Or you can hire an recruiting agency that will find a specialist for according to all set requirements by you, so you will just need to wait. However, this option requires additional large costs, so it is not a good way if you have a tight budget. This option in many cases is the most convenient and reasonable. It means that you outsource the development to another country and hire a dedicated software development team that is specialized in this field and they have everything necessary for the development of software. In case if you need one specialist like Angular developer, you can hire him from any outsourcing company. The development of your project can be done from scratch and on a turnkey basis, so you won’t need to do anything apart from timely payments. The main thing is to find a reliable development company that does its business properly. Cost control. You don’t need to pay additional taxes, you always know what you will need to pay and control your expenses, especially if you chose a Fixed Price model. Quality. Outsourcing companies are in charge of quality and deadlines, so your product will be built within set time frames and meeting the required quality. Time difference. So consider to choose a country to outsource software development in your time zone. 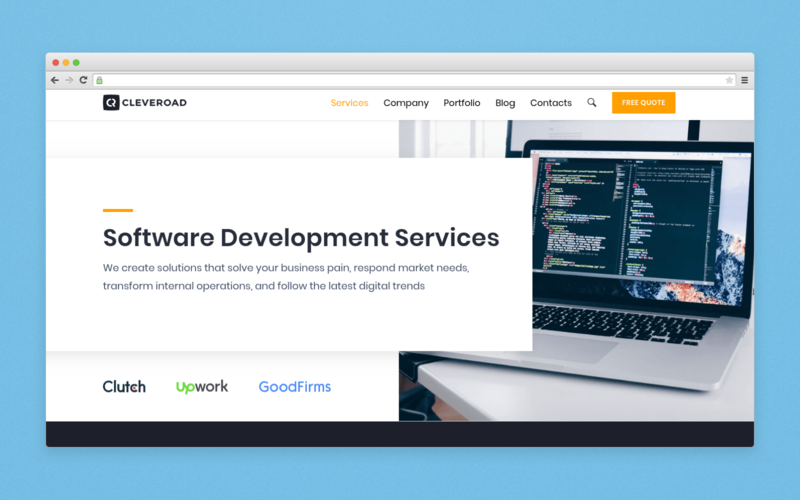 If you plan to outsource the development process and hire Angular team, check Clutch and GoodFirms services that will help you find real reviews and feedbacks about various companies from all over the world. So you will choose a good company that meets your vision most of all. Thus, it will simplify the hiring process and when you read it, you will probably know what type of developer you need and how and where to find it. The next section will tell you about the average hourly rate of freelancers and Angular outsourcing companies in different regions. First, we will show you the hourly rates of freelancers around the world. An hourly rate of outsourced developers may differ, look at the table below. This is an average Angular developer salary and the final rate may depend on the particularities of your project and the skill level of the developers you found. It is worth noting that our company uses Angular often and almost every project is built using this framework. But let’s consider everything in details. First, our website is built using Angular 5. Due to capabilities of Angular, we made it possible to customize particularities of search engine optimization and it makes a website more appropriate for proper indexing by search engines. Then, all admin panels we create as well as web applications - they are all built using different versions of Angular since it is a perfect tool to build large-scale and high-performance web apps. Project idea: Everybody who likes surfing can find instructors using LetsSurf website and go surf together to learn new skills. Project idea: TrainAway website helps you find a gym in any region of the world. More than 130,000 gyms worldwide are available. Project idea: Openmind is a mentoring platform where mentees can find mentors in absolutely various fields of activity. Mentors and mentees can chat with each other, discuss different issues, pay via the website and so on. Tools used for web development: Angular 5 , .Net, jQuery. Find out how much you need to build a website. Read How much does it cost to make a website in 2019? Drawing the line, we can summarize everything you have just read. Before you start looking for Angular developer, you should know all pitfalls you may face and all requirements for a dev, skills he/she must have, what is AngularJS developer hourly rate, how to interview them properly and so on. If you still have any questions, contact us immediately and our managers will answer all your questions. Don’t forget to click on a Subscribe button that you see on the right side - you will always stay tuned!